Women’s Soccer: Never Fear, Fournier is Here! Coming off back-to-back losses, the Concordia Stingers women’s soccer team ended the losing streak with a 2-1 victory over the UQÀM Citadins this past Friday night at Concordia Stadium. The win came courtesy of a goal scored by midfielder Kaitlyn Fournier and a game-winning penalty kick from Frédérique Labelle, and it allowed the Stingers to bypass the Citadins in the standings as they now sit in fifth place, one point up on UQÀM. A few tactical tweaks were made based on studying game tape of the opposition beforehand, according to head coach Jorge Sanchez. 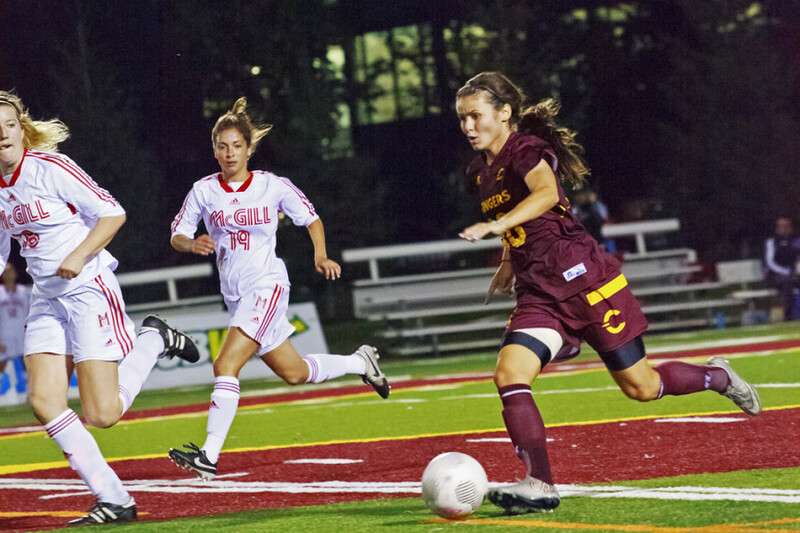 Stingers midfielder Kaitlyn Fournier was a catalyst for her team’s attack. Fournier’s passing stood out, and she delivered numerous crosses to her teammates into the penalty area. Her teammates’ finishing was an issue, however. The Maroon and Gold would come close to a goal mid-way through the first half, but a fine save on the line by UQÀM keeper, Danyka Geoffrion, thwarted any chance on Stingers grabbing the lead. Fournier eventually scored the game’s opening goal in the second half after taking in a pass from teammate Frédérique Labelle. The midfielder dribbled past UQÀM’s defence with ease, and from outside the penalty area, unleashed a shot that found the top right corner of the net. “That’s a goal that not a lot of people can score.” said Sanchez. “You know Kaitlyn, she’s a tank.” said Stinger centre back Elisa Spadafino, who played her first match since being sidelined with an injury. Despite Estel Belval’s late equalizer for the Citadins, the Stingers would score the game winning goal three minutes before the end of the match after Fournier was fouled in the penalty area. Labelle stepped up to take the penalty, and while her initial shot was saved by Geoffrion, she pounced on the rebound and scored. After an encouraging win, Sanchez was left encouraged by his team strong performance. The win was the difference between having potential and making playoffs, according to Fournier, who was named her team’s most valuable player of the match. “It was a good message to other teams that we’re not just a soft team, that we still have quality and we’re a force to be reckon with,” she said. When asked about her goal that opened the scoring in the second half, “It was important” is all a humble Fournier had to say about, arguably, the highlight of the game. After a much needed win, the Stingers will hope to go into the second half of the season with their heads held high, as head coach Jorge Sanchez and the squad remain determined of clinching a playoff spot by season’s end. The Stingers haven’t been in the playoffs since 2005. “Until I look at the standings and there’s no mathematical chance, I’m always hopeful.” said Sanchez. The Stingers’ next match is on Sunday, Oct. 4 against the UdeM Carabins at Concordia Stadium.